← The Image of the Queen of Heaven. The Kursk-Root Icon and the Future of Russia. On the 700th Anniversary of the Appearance of the Kursk-Root Icon. In the Name of the Father, and of the Son, and of the Holy Spirit! Dearly beloved brothers and sisters! I congratulate you on the Russian Church Abroad’s great feast: the 700-year anniversary of the appearance of the Kursk-Root Icon of the Mother of God and the 70-year anniversary of her path in the diaspora alongside the Russian Church Abroad. In order to show the beauty and profundity of this icon, with which the Mother of God herself is always present, we need to return for a bit to the history of the Church and show what manner of gift the Russian Church has received from God. We say that there are three Romes. There is ancient Rome, which through its martyrs broke the iron pillar of the Roman Empire. Pagan Rome gave quite a lot to Christianity, inasmuch as it established the law and defined the human person as a legal entity; it paved countless roads; and it pacified all of Europe, uniting it into the magnificent Roman Empire, into which our Savior was born. The martyrs of the early Christian Church, who had heard the preaching of the Apostles themselves and of their disciples, accepted this preaching with such astonishing clarity that they went to their cruel martyrdoms as if joining a procession. They transformed the Roman Empire by their blood. We remember these great martyrs to this day, and will remember them until the end of the ages. Later there was the second Rome, Byzantium, which allowed the teaching of the Orthodox Church to pass through the crucible of thought, reason, and human understanding; to this end it made use of the legacy of Greece, which from ancient times had become practiced in human syllogisms and illogisms. Its philosophical heritage was employed in systematizing the Orthodox Church’s teaching. This was the greatest achievement of the second Rome: Byzantium, Constantinople. Later, when this empire had been destroyed – for there is nothing eternal upon this earth – Moscow became the Third Rome. We have no reason to be ashamed of saying that Moscow was the Third Rome. What gift of God did Moscow, Holy Russia, receive? We know of the countless sufferings through which the Holy Fathers of previous epochs had defended the faith and purity of Orthodoxy from countless heretics. When Orthodoxy spread throughout the Russian plains, the Russian soul in its collectiveness [sobornost] sought its own gift of God, which it found by turning to the Mother of God. The Russian people particularly venerate the Mother of God, which distinguishes our country and our traditions of the Orthodox faith. Of course, other peoples also venerate the Mother of God, but the Russian people chose the Mother of God for special veneration and reverence, as the door to the Heavenly Kingdom. The Mother of God was our special Protectress: there was not a single corner of the whole expanse of the former Russian Empire into which some miraculous icon of the Mother of God had not appeared that was venerated either locally or throughout the nation. 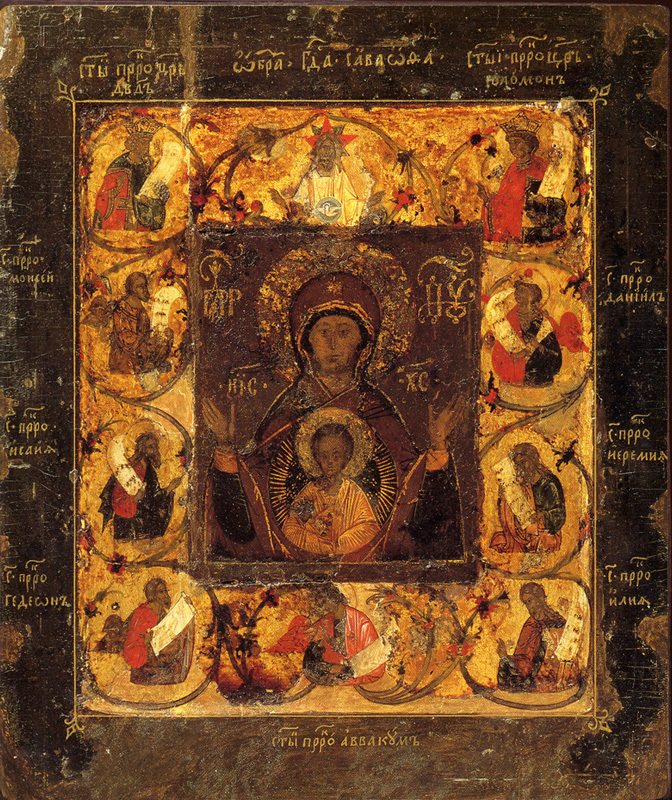 The entire Russian land was sanctified by these holy icons; the Russian people believed that the Mother of God herself was invisibly present, as it were, at each icon. This is our particularity. We will enter the Heavenly Kingdom through the Mother of God. The Mother of God is always depicted with the infant Christ the Savior. This particularity of icon-painting hearkens back to an ancient tradition that tells of some freethinking and insolent people who, looking at the Mother of God during his lifetime, said: “How can she be the Mother of God? How could she have given birth to God? How is this possible?” Then the Mother of God raised her most pure hands to heaven, seeking the protection of God, just as she is depicted on the Kursk-Root Icon. Then the Lord showed Himself to these disputers of this world in her most pure womb, just as He is depicted on her icon. These cowards, seeing such an incredible miracle, were cast into the fear of God; and the insolent people, who were infected with incurable pride, fled in terror, having seen the Savior’s face as Judge in anticipation of His Second Coming. This is our icon. With the raised hands of the Mother of God it addresses all non-believers and believers alike, that they might learn to fear disbelief. This best witnesses to our entire people that the Mother of God is truly the Theotokos, that she truly bore our God and Savior. The particular Russian piety for venerating the Mother of God is a response to the Russian soul’s age-old yearning to perceive God’s grace, which cannot be reduced to an abstract concept, distinctly and actually. The Mother of God also showed her protection to such great saints as our St. Sergius of Radonezh, to whom she appeared more than once, and in more recent times to St. Seraphim of Sarov. Recall how St. Seraphim, sitting on a log in the dense forest, revealed God’s grace to Motovilov distinctly and actually. 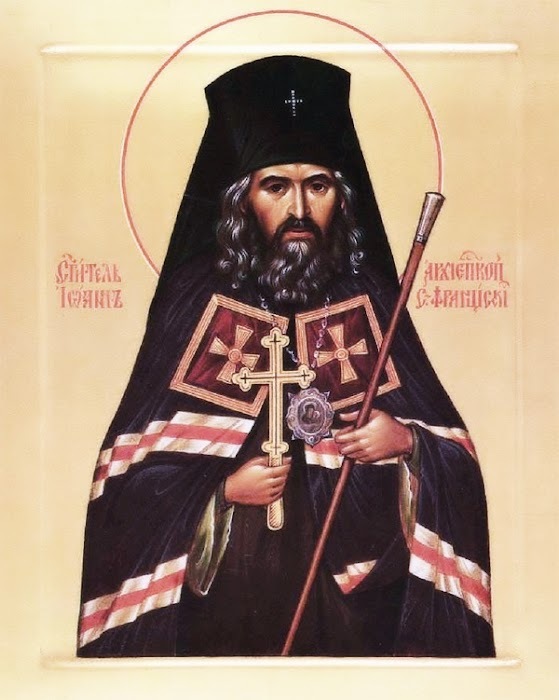 St. Seraphim embraced him and suddenly the grace of the Holy Spirit moved from the saint to Motovilov who, perceiving God’s grace in fear and trembling, felt as though he were not on earth but in heaven. This is what the Russian people seek: it desires to perceive God’s grace actually and completely. This is the ideal of the Russian soul. Now, beloved brothers and sisters, we are all full of sorrow and grief for our Motherland, which had been called the home of the Mother of God, which had been Holy Russia, and which had been traversed from length to breadth by holy God-pleasers shedding tears of repentance. They shed so many tears that one could likely have been baptized in them, as in the baptismal waters. This had truly been Holy Russia, and it was trampled upon when the holy things of the Russian land were rejected. For to whom much is given, much is required. We are in constant mourning for our Motherland, for Holy Russia. We should all pray for it, for every one of us shares responsibility for what takes place there. We are the descendents of those who lived in Russia when it became spiritually lukewarm; it is very difficult for us to overcome this sinful predisposition. This is what we who are in the diaspora have in common with those who live in Russia; this is what ties us together. We need to repent, to recover this spiritual ideal of Holy Russia within ourselves, for this is the only way we can change the fate of the Russian people. The Russian nation is not small, and when it will again believe in God and find Him, then the entire world will experience the consequences. Thus, my beloved brothers and sisters, each of us should pray that the Lord might help raise our Motherland anew. We should ask the Lord in prayer: “Lord, save Russia!” – but not in any geographical sense, but rather in the sense that Russia is each one of us. Each one of us, therefore, bears responsibility before God for the death or rebirth of Russia. Each one of us should take it upon himself to take refuge in repentance, to get on our knees – even if we do not have prayer books or service books – and simply raise our hands like the Mother of God and say with our whole hearts: “Lord, forgive me! Lord, have mercy on me and help me.” Rebirth will begin from that very moment. This is something that everyone should do, without fail and personally – for everyone is a living particle of Holy Russia. For we are people, not objects. Each one of us is responsible for this, and each one of us is capable of turning the history of Russia to God if he takes this upon himself. There is no point thinking about anything else, or of putting one’s hope on someone else, for everyone should take responsibility for his own self, recalling the words of St. Seraphim of Sarov: “save your soul, and thousands will be saved around you.” These words of the great God-pleaser and man of prayer should help us to think about our salvation and to embark on the path of repentance. This is the only way out for Russia and for the entire world, for if Russia perishes, then the whole world will perish; and if Russia rises, it will certainly cause the whole world to rise with it. We are all connected: the fate of humanity is connected with that of Russia, where the great mystery of the battle between good and evil, between Satan and God, is taking place. Each one of us is a participant in this battle, even if he has left his Motherland, so long as bears a Russian heart. Let us pray to the Mother of God, since her greatest prayer is that she might teach us to love Christ the Savior. This is what the Mother of God expects of us: she expects us to love our Savior and God, and then she will hear our prayer and come to our aid. When we will come to love the Savior, we will see how much we differ from Him – even though we strive to unite ourselves with Him in the Heavenly Kingdom – and this will add sincerity to our repentance. Repentance is an all-amending force capable of transforming the entire world. All the best that has been done and written in the Orthodox Church has been derived from repentance, beginning with King David: he sinned grievously in murder and adultery, but gave us the Psalter, that model of lofty, prayerful lamentation, that fruit of his repentance. This entry was posted in News, Orthodox Faith and Life. Bookmark the permalink.